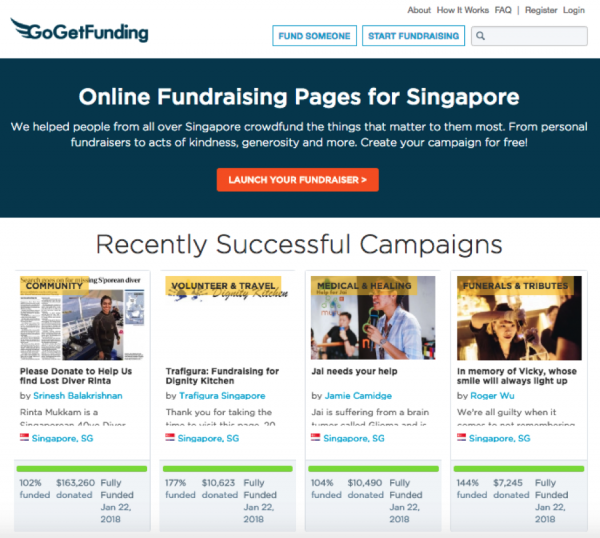 Who are the crowdfunding platforms in Singapore? Ever heard of crowdfunding or came across this term somewhere, but at the same time you are unsure of what EXACTLY is it? Crowdfunding is a term that should be known throughout the startup and entrepreneur industry. Below is what you will find if you were to hit up the Dictionary under Google’s search results. If you were to decipher and breakdown the words separately into (Crowd + Funding), it is pretty self-explanatory. There has been a noticeable pattern seen in Singaporeans or those who reside in Singapore to adopt anything that is viral, trendy, or successful online, or offline. There is no exception when it comes to the entrepreneur industry where the term “Crowdfunding” is one of the many avenues where startups are able to source and raise money for their ventures, projects, products or a service. But not many are sure of what entails crowdfunding, the risks, rewards, repayments, what to expect and what not based on the categories of the respective crowdfunding types. Today, be it looking to fund a project or an idea, or even get funded for a product, you have to know how to differentiate the several kinds of crowdfunding if it is not being explained or broken down in the crowdfunding campaigns. Fundraisers should also take note the different types of crowdfunding in order to entice and increase the success rate of your crowdfunding campaign. In short, these are the current types of crowdfunding that startups or companies use to raise funds under a projected timeline. With a keen eyesight and some luck, you might be funding for the next Facebook, Grab, or products such as a smart charging cable where almost everyone with a smartphone would have these days. Every individual, startup/company or even contributor has something they want to see at the end of the tunnel, be it a prototype product that will eventually be available everywhere, being part of a movement to advocate awareness of something important, or being a shareholder in the next Grab/Airbnb. Numerous question marks would have already begin surfacing by now if you are one of the following above. For instance, you have a novel product or a really unique idea that requires some fund to be raised, or as much money as you can get your hands on under a short period of time. The next question is, would it be easy to source for the right audience or the right group of people to hear you out, let alone worry how big this particular group of people is? Where should you start? Who should you approach? Here are a couple of popular sites that you are able to view the current projects that are available for funding, or start a campaign to raise your own funds today! 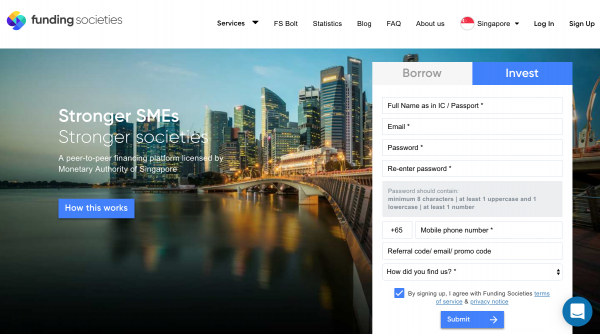 Funding Societies is Southeast Asia’s leading peer-to-peer financing platform, and the first to crowdfund more than SGD 130 million, the largest crowdfunded SME loan amount in the region in about 2.5 years. With Funding Societies, one can invest with an amount as low as $50. Credit-worthy SMEs that require funds may secure business loans from $5,000 up to $1.5 million. In 2015, Funding Societies became the first debt crowdfunding platform in Singapore to engage an independent trustee to manage the investor funds, unlike the practice adopted at that point in time by most platforms. This was done even before any regulatory mandate. It was an expensive but necessary decision to ensure that investors’ monies are handled professionally and safely. It is always good to do some prior research and read up on crowdfunding, or even the websites that you were being referred to, or interested in before committing into any of these crowdfunding websites especially when money is involved. Recently, there has been an increase in crowdfunding platforms who want a piece of the pie. Hence, the Monetary Authority of Singapore (MAS) will be stepping in with to facilitate this whole process, having say in areas where money is involved, so that donors or even investors would have the ease of mind when contributing to an idea or product. Always be sure to keep a look out when making your donation, or starting a crowdfunding campaign. . Ensuring that the company is being licensed by the MAS is important because we all want to know that our money is safely being funded for the intended purpose rather than a case of fraud or scam with fake crowdfunding campaigns ongoing. If you need more information or official updates from the MAS regarding crowdfunding, do always check into the MAS media releases or simply search up the name of the company under “Capital Markets” to see if they are . Crowdfunding can be fast in raising finance but building up interest with the crowds can be very challenging.